In 48 of 50 states in the US, new attorneys are required to pass a 60 multiple-choice question exam on legal ethics in addition to passing their state’s bar exam. This is known as the Multistate Professional Responsibility Examination (MPRE). I well recall taking this test myself. The subject matter of this test is the professional ethical roles and responsibilities a lawyer must abide by as an advocate and counselor to clients, courts and the legal profession. It is founded upon a series of ethical considerations and disciplinary rules that are strictly enforced by the bars of each state. Violations can potentially lead to a series of professional sanctions and, in severe cases depending upon the facts, disbarment from practice for a term of years or even permanently. In other professions including, among others, medicine and accounting, similar codes of ethics exist and are expected to be scrupulously followed. They are defined efforts to ensure honesty, quality, transparency and integrity in their industries’ dealings with the public, and to address certain defined breaches. Many professional trade organizations also have formal codes of ethics but often do not have much, if any, sanction authority. Should some comparable forms of guidelines and boards likewise be put into place to oversee the work of big data researchers? This was the subject of a very compelling article posted on Wired.com on May 20, 2016, entitled Scientists Are Just as Confused About the Ethics of Big-Data Research as You by Sharon Zhang. I highly recommend reading it in its entirety. I will summarize, annotate and add some further context to this, as well as pose a few questions of my own. Last month. an independent researcher released, without permission, the profiles with very personal information of 70,000 users of the online dating site OKCupid. These users were quite angered by this. OKCupid is pursuing a legal claim to remove this data. Earlier in 2014, researchers at Facebook manipulated items in users’ News Feeds for a study on “mood contagion“.¹ Many users were likewise upset when they found out. The journal that published this study released an “expression of concern”. Users’ reactions over such incidents can have an effect upon subsequent “ethical boundaries”. Nonetheless, the researchers involved in both of these cases had “never anticipated” the significant negative responses to their work. The OKCupid study was not scrutinized by any “ethical review process”, while a review board at Cornell had concluded that the Facebook study did not require a full review because the Cornell researchers only had a limited role in it. Both of these incidents illustrate how “untested the ethics” are of these big data research. Only now are the review boards that oversee the work of these researchers starting to pay attention to emerging ethical concerns. This is in high contrast to the controls and guidelines upon medical research in clinical trials. In the US, under the The Common Rule, which governs ethics for federally funded biomedical and behavioral research where humans are involved, studies are required to undergo an ethical review. However, such review does not apply a “unified system”, but rather, each university maintains its own institutional review board (IRB). These are composed of other (mostly medical) researchers at each university. Only a few of them “are professional ethicists“. To a lesser extent, do they have experience in computer technology. This deficit may be affecting the protection of subjects who participate in data science research projects. In the US, there are hundreds of IRBs but they are each dealing with “research efforts in the digital age” in their own ways. Both the Common Rule and the IRB system came into being following the revelation in the 1970s that the U.S. Public Health Service had, between 1932 and 1972, engaged in a terrible and shameful secret program that came to be known as the Tuskegee Syphilis Experiment. This involved leaving African Americans living in rural Alabama with untreated syphilis in order to study the disease. As a result of this outrage, the US Department of Health and Human Services created new regulations concerning any research on human subjects they conducted. All other federal agencies likewise adopted such regulations. Currently, “any institution that gets federal funding has to set up an IRB to oversee research involving humans”. However, many social scientists today believe these regulations are not accurate or appropriate for their types of research involving areas where the risks involved “are usually more subtle than life or death”. For example, if you are seeking volunteers to take a survey on test-taking behaviors, the IRB language requirements on physical risks does not fit the needs of the participants in such a study. In 2013, AAUP issued a report entitled Regulation of Research on Human Subjects: Academic Freedom and the Institutional Review Board, recommending that the researchers themselves should decide if “their minimal risk work needs IRB approval or not”. In turn, this would make more time available to IRBs for “biomedical research with life-or-death stakes”. This does not, however, imply that all social science research, including big data studies, are entirely risk-free. Dr. Elizabeth A. Buchanan who works as an ethicist at the University of Wisconsin-Stout, believes that the Internet is now entering its “third phase” where researchers can, for example, purchase several years’ worth of Twitter data and then integrate it “with other publicly available data”.² This mixture results in issues involving “ethics and privacy”. Recently, while serving on an IRB, she took part in evaluated a project proposal involving merging mentions of a drug by its street name appearing on social media with public crime data. As a result, people involved in crimes could potentially become identified. The IRB still gave its approval. According to Dr. Buchanan, the social value of this undertaking must be weighed against its risk. As well, the risk should be minimized by removing any possible “idenifiers” in any public release of this information. As technology continues to advance, such risk evaluation can become more challenging. For instance, in 2013, MIT researchers found out that they were able to match up “publicly available DNA sequences” by using data about the participants that the “original researchers” had uploaded online.³ Consequently, in such cases, Dr. Buchanan believes it is crucial for IRBs “to have either a data scientist, computer scientist or IT security individual” involved. Likewise, other types of research organizations such as, among others, open science repositories, could perhaps “pick up the slack” and handle more of these ethical questions. According to Michelle Meyer, a bioethicist at Mount Sinai, oversight must be assumed by someone but the best means is not likely to be an IRB because they do not have the necessary “expertise in de-identification and re-identification techniques”. A technology researcher at the University of Maryland 4 named Dr. Katie Shilton recently conducted interviews of “20 online data researchers”. She discovered “significant disagreement” among them on matters such as the “ethics of ignoring Terms of Service and obtaining informed consent“. The group also reported that the ethical review boards they dealt with never questioned the ethics of the researchers, while peer reviewers and their professional colleagues had done so. However, IRBs who “actually have power” are only now “catching up”. Beyond universities, tech companies such as Microsoft have begun to establish in-house “ethical review processes”. As well, in December 2015, the Future of Privacy Forum held a gathering called Beyond IRBs to evaluate “processes for ethical review outside of federally funded research”. In conclusion., companies continually “experiment on us” with data studies. Just to name to name two, among numerous others, they focus on A/B testing 5 of news headings and supermarket checkout lines. As they hire increasing numbers of data scientists from universities’ Ph.D. programs, these schools are sensing an opportunity to close the gap in terms of using “data to contribute to public knowledge”. Would the companies, universities and professional organizations who issue and administer ethical guidelines for big data studies be taken more seriously if they had the power to assess and issue public notices for violations? How could this be made binding and what sort of appeals processes might be necessary? At what point should the legal system become involved? When do these matters begin to involve civil and/or criminal investigations and allegations? How would big data research experts be certified for hearings and trials? Should teaching ethics become a mandatory part of curriculum in data science programs at universities? If so, should the instructors only be selected from the technology industry or would it be helpful to invite them from other industries? How should researchers and their employers ideally handle unintended security and privacy breaches as a result of their work? Should they make timely disclosures and treat all inquiries with a high level of transparency? Should researchers experiment with open source methods online to conduct certain IRB functions for more immediate feedback? 1. For a detailed report on this story, see Facebook Tinkers With Users’ Emotions in News Feed Experiment, Stirring Outcry, by Vindu Goel, in the June 29, 2014 edition of The New York Times. 2. 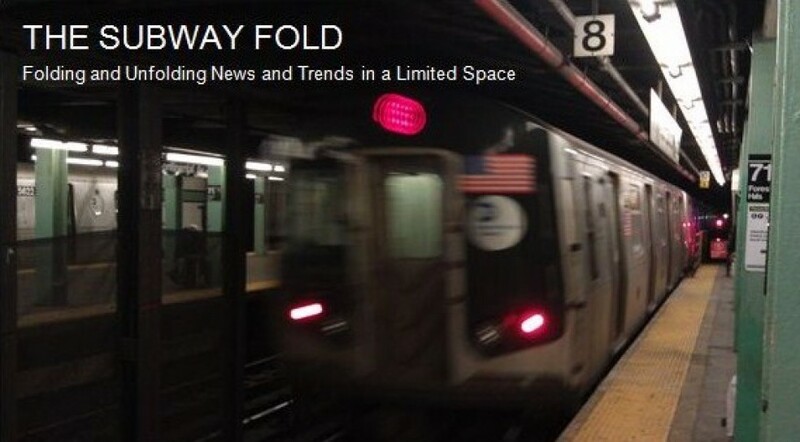 These ten Subway Fold posts cover a variety of applications in analyzing Twitter usage data. 3. For coverage on this story see an article published in The New York Times on January 17, 2013, entitled Web Hunt for DNA Sequences Leaves Privacy Compromised, by Gina Kolata. 4. For another highly interesting but unrelated research initiative at the University of Maryland, see the December 27, 2015 Subway Fold post entitled Virtual Reality Universe-ity: The Immersive “Augmentarium” Lab at the U. of Maryland. 5. For a detailed report on this methodology, see the September 30, 2015 Subway Fold post entitled Google’s A/B Testing Method is Being Applied to Improve Government Operations.